I did this tiger on jenn from young blood’s knee cap, she sat like a thug for it. 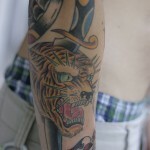 new tiger head tattoo on pete by Chuck Donoghue. © 2019 Only You Tattoo|ProPhoto Photography Template by NetRivet, Inc.